False: There is little training required when using industrial carts. Basics of uses and application, coupling and de-coupling is learned quickly, safely, and easily. There is a remarkable change to the use of industrial carts and their effectiveness. 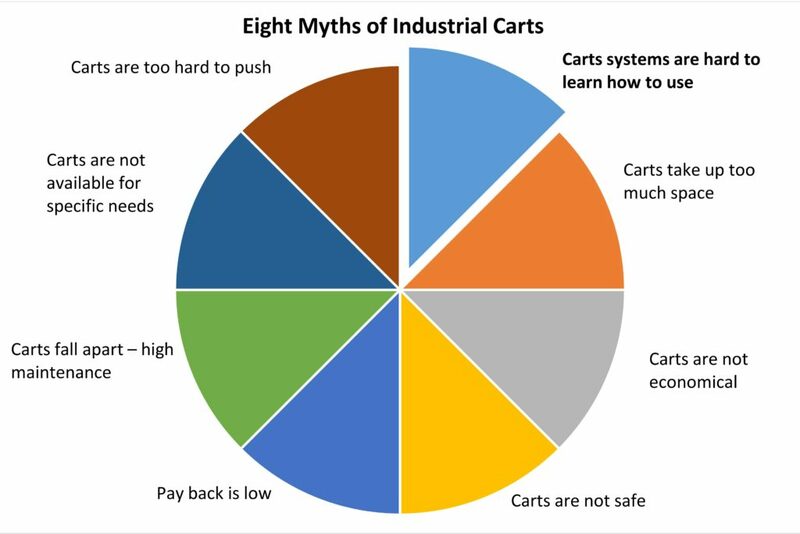 Myths and negative attitudes towards industrial carts change upon the first use. Topper Industrial Rotation Carts are able to manually rotate and position parts for minimized over reaching and lifting. A tilt cart is a specified industrial cart base with a rotating top. The tops rotate 360 degrees to the various operator workstation. Topper’s Rotation Carts come in a 4-wheel or 6-wheel design. The operator is quickly able to rotate the unit by releasing the foot actuated detent to rotate and access parts from any side from one position. The detents automatically locks every 90° or 180.° This secures the rotation top, so that the operator can work out of the unit safely. The effortless rotation is due to the heavy duty sealed precision slew bearing that can handle cantilevered loads with ease and is virtually maintenance free. Rotating the unit is immediately learned and understood by just release the foot actuated detent to rotate and access parts from any side from one position. The detents automatically lock out every 90° or 180° which secure the rotation top when operator works out of the unit. The effortless rotation is due to the heavy duty sealed precision roller bearing that can handle cantilevered loads with ease and is virtually maintenance free. Spring-loaded upper frame helps auto rotate cart loads. To reduce operator timing requirements, the Auto-Rotate cart by Topper Industrial has a spin function that is faster than comparable carts. Featuring a four-wheel cart base bottom frame, the top portion has a manual hand-operated rotate frame equipped with a spring mechanism. To operate, a worker pulls the frame by hand with a twist back motion to spring load the cart when it hits the detent. The frame stays in place until the operator engages the foot pedal, allowing it to return to its original position. Designs and engineering nuanced for various industrial carts applications; each cart is designed with specific plant floor applications in mind. Whether an engineered-to-order cart or an application for a standard cart, creating easy to learn, easy to use best-in-class solutions is a standard. Some of the ISO 9000 standard includes ease of learning use of systems and tools. Topper Industrial achieved ISO 9001:2000 Registration. Demonstrated customer focus and continuous improvement are key elements in these standards. The ISO system is being used to improve the quality of all products and improve efficiency and effectiveness of the U.S.-based production processes. 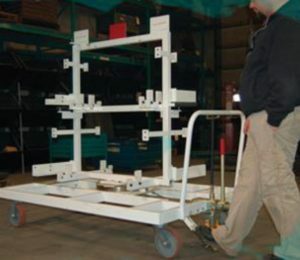 Next post Industrial carts are a great compliment for lean manufacturing environments.